Detects weight loss as a function of temperature change for a variety of materials, including homopolymers, copolymers, low molecular weight compounds, and mixtures of these, and measures their thermal stability and heat resistance. 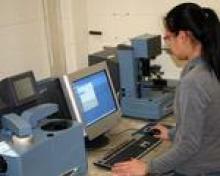 Determines the moisture content of polymers and related materials and the amount of volatiles in elastomer systems. Routine analyses between ambient and 1000°C with capability to perform studies up to 1000°C. Equipped with a 16-chamber auto-sampling platform.